Taper Collet MT3 (MS3) M12. For direct mounting on the machine spindle, for cutters with cylindrical shank. 6 / 8 / 10 / 12 / 14 / 16 / 18 / 20mm (1 each). 4 / 6 / 8 / 10 / 12 / 14 / 16 / 18 / 20mm (1 each). Direktspannzange MK3 M12 1-20mm , nach Ihrer Wahl. 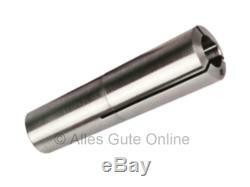 Taper Collet MT3 (MS3) with M12 drawbar thread , according to your choice. Industriequalität, komplett gehärtet und geschliffen. Neue Ware in sehr guter Qualität. Lesen Sie bitte meine Bewertung. The item "Morse Taper Collet MT3 (MS3) M12 536E #303 d=" is in sale since Tuesday, April 22, 2014. This item is in the category "Business, Office & Industrial\Metalworking/Milling/Welding\Milling". The seller is "allesgute88" and is located in Neuenbürg. This item can be shipped worldwide.